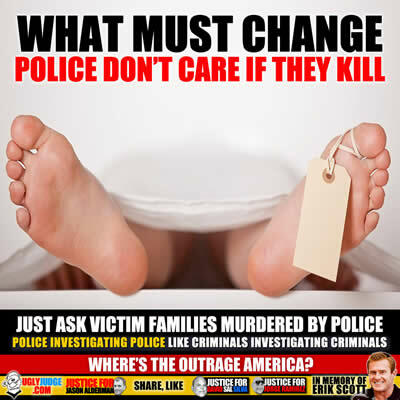 What should really bother Americans is what police do after they execute, murder or kill a person. No matter how you look at it a death is NOT a good shooting. A life is taken, lost forever and due to that armies of victims are formed on a daily basis. Hand cuffing dead bodies, unarmed dead bodies, innocent dead bodies. Police acting and being supported by a broken system which allows them to kill with impunity. We’ve support police so much, looked the other way so much, trusted the badge and image so much. They’re using it against us to get away with crime and murder. There’s Something Disturbing About The Way Cops Act Just After They’ve Shot Somebody Don’t they see a fellow human being lying there? The ubiquity of cellphone, dashcam and surveillance video has transformed the way the public understands police violence. But as scene after scene unfolds on shaky screens and in grainy contours, another element of the violence is beginning to come into focus: the pattern of officers showing no concern for the person they have shot, often fatally. Set aside the question of whether the shooting was justified, either legally or morally. Perhaps it was. Perhaps the officer had no other choice. Even in such a situation, though, the officer has just exercised the most terrifying of powers ― the use of lethal force against another human being. And yet no care is taken of that human being. Consider the most recent shooting caught on video: that of Charles Kinsey, who fortunately survived. Kinsey, a black caretaker in North Miami, was trying to help a man with autism who was sitting in the street blocking traffic. A cellphone video shows Kinsey himself lying on the ground with his hands in the air. He was trying to explain to police that the other man had a toy truck and not a gun, contrary to whata 911 caller had reported. One of the officers fired three times, shooting Kinsey in the leg. Then he said he was handcuffed and left bleeding on the street for 20 minutes before an ambulance arrived.